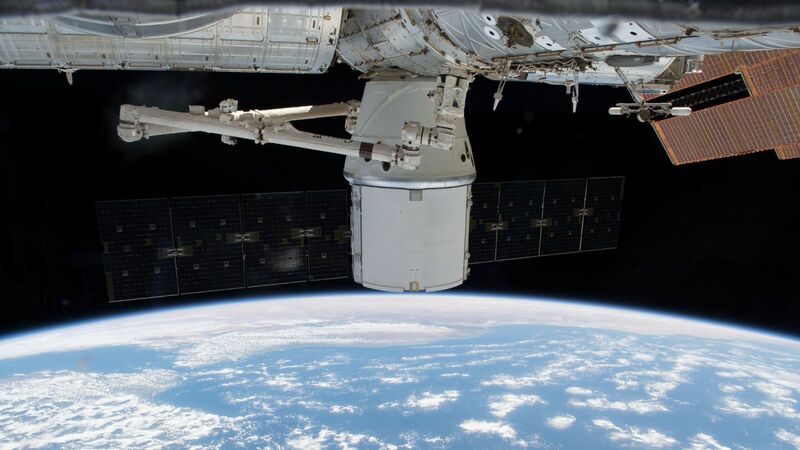 Originally scheduled for May 2, 2018, SpaceX’s CRS-14 Dragon cargo ship, which is currently attached to the International Space Station, is now expected to return to Earth May 5, according to NASA. “Dragon’s departure was pushed back from Wednesday after SpaceX personnel observed high sea states in the Pacific Ocean splashdown zone southwest of Long Beach, California,” the U.S. space agency said in a statement. Some of that cargo will be removed once the capsule is transported to Long Beach, California, NASA said. However, the rest will be removed and transferred to the space agency once Dragon is transported to SpaceX’s test facility in McGregor, Texas, for final processing. Among the experiments NASA said are being returned are samples from the Metabolic Tracking study, which is studying techniques to improve pharmaceuticals in microgravity; the APEX-06 investigation, which is looking at the development and gene expression of seedlings from grain crops; and the third Fruit Fly Lab, which is studying the effects of microgravity on innate immunity. Also among the cargo being returned is Robonaut2. The humanoid robot, which was launched in aboard Space Shuttle Discovery 2011, is in need of repair. CRS-14 is the second fight for this particular Dragon spacecraft. The first time it traveled to the ISS was in April 2016 during the CRS-8 mission. This is 14th SpaceX flight under NASA’s Commercial Resupply Services program. The company has six more flights scheduled to be performed under the first phase of the contract before the second phase, Commercial Resupply Services 2, begins. capable of returning cargo as you say ‘downhill’. But it gets wet,in the nasty ocean, no less. Why not ‘Dragon 2’ ?. Propulsive landings for SpaceX are relativly routine. Why not ISS resupply as a dress rehearsal.